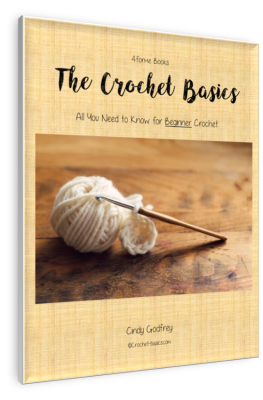 Crochet Basics are the simple things that you just need to know to start crocheting. This is where all the fun begins, though, because now it’s all hands on from here! Learn these fundamentals and you'll have much more success on your projects later. We'll start with two essentials, holding the hook and holding the yarn. There are 2 basic ways you can hold your crochet hook. 1. Hold the hook like you would a pencil. Your thumb should be on the flat part of the hook and your index finger is on the top. 2. Hold the hook like you would a knife. Your thumb should be on the flat part and your other fingers should be holding the hook. It doesn’t matter which way you hold your hook. Try both ways and see which one is comfortable for you. Be careful not to hold your hook too tightly or to hold it too close to the tip. I personally hold my crochet hook like a pencil. My 10 year old son struggles with holding it that way and prefers to hold his hook like a knife. The yarn is held in your left hand. It controls the tension of the yarn. This helps make it easier to crochet and your piece will look much neater. There is mainly 2 ways of holding your yarn. (Crochet –it’s just full of choices.) In both cases, the yarn is wrapped around or between your fingers. 1. Hold the end of your yarn with your right hand and bring the yarn between your pinky and ring finger of your left hand, back to front. Wrap the yarn around the back of your pinky finger and then in front of your next two fingers. Bring the yarn around the back of your index finger and pull until you have about a 4 inch tail. Hold the tail with your thumb and middle finger. Crochet Basics Help. . . When teaching my kids to crochet, this was one of the most frustrating things for them. So don’t worry if it takes some getting used to. Hold the end of the yarn with your right hand. Bring the yarn between your pinky and ring finger of your left hand, front to back. Weave the yarn through your fingers, ending around the top of your index finger. Pull the yarn until you have about a 4 inch tail. Try both of these. See which one is right for you. The yarn should glide easily through your fingers. I like the first hold. It’s what works best for me. When I try the second hold, the yarn tends to get hung up on my wedding ring. You might find this to be an issue for you, too. So, see what works. 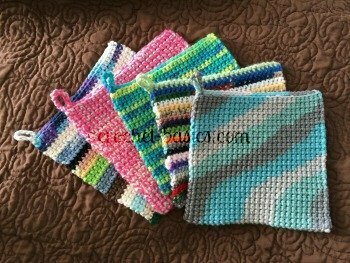 Don’t worry if you need to stop while you’re crocheting to re-weave the yarn through your fingers. It will need to be adjusted from time to time. It’s always better to have it right than to end up with sloppy work. 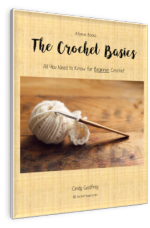 You’ve got your hook and yarn; now continue learning crochet basics with the slip knot and chain stitch.